From reviews in Science and Nature to high praise from Carl Safina, E.O. Wilson, and Alan Weisman, everyone is buzzing about Immersion. We caught up with author Abbie Gascho Landis to talk about the book, freshwater mussels, and our relationship to the natural world. Read our conversation below, and don't forget to read Chapter 1 of Immersion in last week's #ForewordFriday. You’re a veterinarian, meaning your background is with vertebrates like cats and dogs. What first captivated you about freshwater mussels? Was it a single moment, or did it happen over time? Since then, what has sustained your interest? Submerging my face in a creek for the first time stands out as a revelatory moment for me. I had no idea such beautiful animals lived inside this drab-looking creek that I had ignored while driving over the bridge. Although my first mussel encounter was memorable, I actually fell in love with mussels over time. If I were to summarize my journey with freshwater mussels in one sentence, it would be, “Wait, what?” I have said this repeatedly while talking with my husband or exploring a creek or reading about mussel science. Mussels make me stop in my tracks and light up my curiosity and wonder. Studying mussels has been similar to practicing veterinary medicine in that my patients frequently amaze me in one way or another. Also, mussels attract great people and live in intriguing places, so spending time with mussel biologists and in the field always energizes my mussel fascination. In the book you write: “I think of mussels as I watch the kitchen spigot run.” What do you mean by this? What can mussels tell us about our own water supply and consumption habits? For me, learning about mussels coincided with learning precisely where our tap water came from in our Alabama town. This connection was not an extrapolation or a metaphor. A creek I snorkeled was the actual city water supply and received the treated municipal wastewater. When drought and over usage dry such a creek, both mussels and humans experience the shortage. When we contaminate the creek, we damage everyone using that water downstream. These lovely little animals sit in our drinking water and our wastewater, filtering it and suffering from it. The least I could do was think of them while I filled my glass with part of their home. Most conversations around freshwater in the US revolve around the West, but your book brings readers to the creeks and streambeds of the American Southeast. Why is it important to pay attention to this region? What can it teach us about water throughout the rest of the country? Having viewed the American Southeast as eternally lush and damp almost to a fault, I was floored to learn about its ongoing water shortage problems. One large river basin, draining the Apalachicola, Chattahoochee, and Flint Rivers, sits at the junctions of Alabama, Georgia, and Florida, and at the heart of decades-long legal battles known as the Tri-State Water Wars. Human water demand, especially agriculture, outpaces natural recharge, especially during droughts. Climate change is causing more frequent droughts, taking a heavier toll on groundwater resources. Freshwater mussels—more diverse in the Southeast than anywhere else in the world—die in drying creeks, invoking the Endangered Species Act to protect their habitat. Water issues in the Southeast pose challenges both similar to and unique from the American West, and they suggest that our freshwater conversations have more urgency than we think, even in areas that might seem impervious to struggles over water. Water security has more to do with how much water we use than with how much water is available. Immersion is about mussels, but the book is also full of human characters, including scientists, landowners, police officers, and your own young children. What can freshwater mussels teach us about our relationships to other people? To the environment? Studying mussels is excellent practice in understanding complex, overlapping relationships. Mussels live at the intersection of land and water, shaped by the character of the river bottom as much as the water flow and quality. We often divide our environment—land or water, urban or rural, mine or yours—but rivers cross what we view as boundaries. At river bottom, mussels can give us a unique angle on how the landscape and water flowing through it connect us. Nearly seventy percent of freshwater mussel species are imperiled, but Immersion is not despondent. 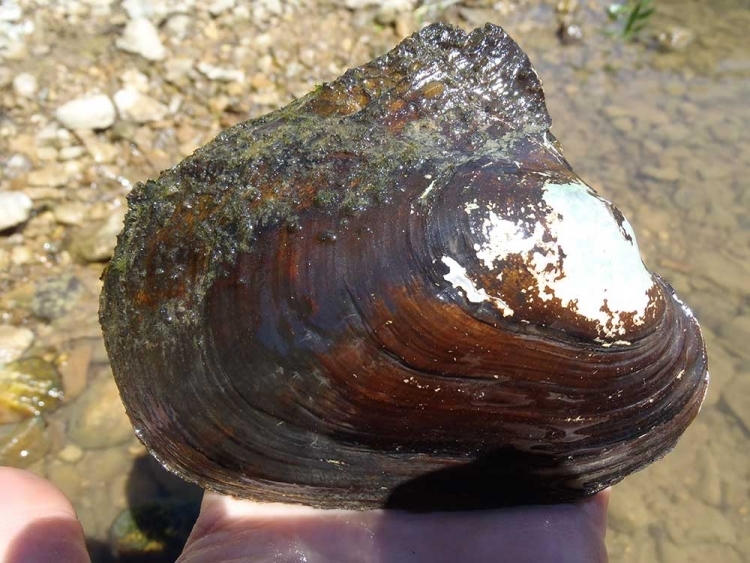 What gives you hope for freshwater mussels in the US? 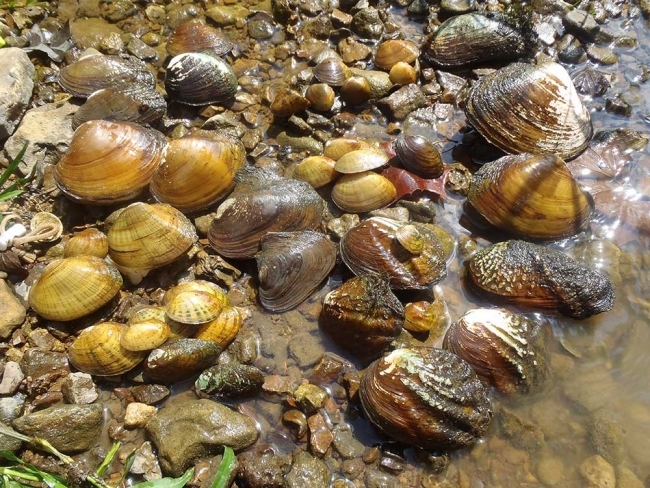 Besides simply being an incorrigible optimist, I find hope in places like Alabama’s Paint Rock River, where improvements in land use along the river valley have revived mussel populations from nearly flat-lining to the heartbeat of a healthy river. I find hope in collaborative watershed groups, working across political or business interests to keep rivers flowing. I also find hope in mussel biologists raising new populations of nearly extinct mussel species, then reintroducing hundreds or thousands of them to healthy rivers. I find hope in projects like the summer 2016 relocation of nearly half a million mussels prior to building a bridge over the Mississippi River. I get a little teary when I imagine such attention to so many small, valued lives. As the poet Jane Hirshfield wrote, “What is usual is not what is always.” Each exception to the trend of damaging mussels and their rivers nudges mussels—and our water supply—towards safety. So many things. Small facts about mussels surprised me. For example, many mussel species will actively burrow down or crawl towards water to try to survive drought. And a mussel closing their shell is an active process, which happens reflexively if they sense danger—a vibration, passing shadow, or noxious chemical. Also surprising to me was the breadth and depth of change humans have caused in streams of all sizes. Only two percent of streams in the United States are freely flowing, thanks to dams, and many carry contaminants, including pharmaceuticals or excessive nutrients. The combination of these surprising things, though, is what truly astounded me. Given their exquisite sensitivity and our decimation of their homes, I am happily amazed that freshwater mussels continue to exist at all. It would be really neat for readers to carry with them some images and stories of mussels or rivers that they can’t help describing at picnics and cocktail parties. If some of those conversations fuel further curiosity about river animals or our water supply, I will be thrilled. And while I’m hoping: Some experience of this book might overflow into larger discussions about how we can work together towards healthy rivers so that mussels and our kids will have clean, plentiful fresh water.